Platysma is located within the superficial fascia of the side of the neck and it is a thin quadrilateral broad sheet of muscle. From the front of the neck it rises over the face. It symbolizes the residue of panniculus carnosus of animals anatomically. Its point of development is from the 2nd pharyngeal arch. The anteroinferior part of the posterior triangle and superior part of the anterior triangle of the neck are covered by it. The platysma emerges from skin as well as deep fascia enveloping the upper portions of the pectoralis major along with anterior portions of the deltoid muscle. It has three extended portions: the nodular, labial, and mandibular. The posterior rim of the platysmal sheet spans from the angle of the jaw towards the inner border of the acromion. The front edge, beginning at the chin, continues while being combined with the muscle of the other side midway down towards the hyoid bone, where the throat cartilages are exposed and the two sides separate and diverge. The front edge lateral towards the sternohyoid muscle that travels below the sternomastoid then travels across obliquely above the inferior part of the sternal head of the sternomastoid. In the end, before terminating on the chest it goes above the medial end of the clavicle. Whenever the muscle is tightened, the anterior and posterior edges are visible. After emerging, the fibers curve superficial towards the clavicle and sternocleidomastoid upwards and forwards. In order to connect with the lower border of the mandible, it travels above the lower part of the posterior triangle as well as upper part of the anterior triangle, the point where anterior fibers decussate with the equivalent fibers of the other side across the midline for approximately 2.5 cm below as well as behind the symphysis menti. Into the lower border of the body of the mandible, most of the intermediate and posterior fibers are attached. 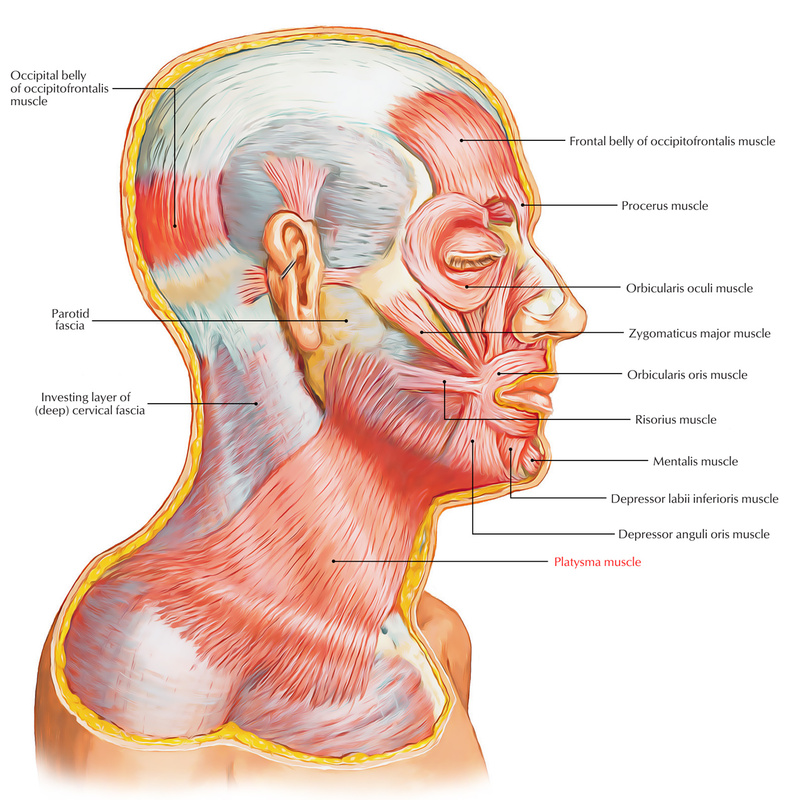 Towards the angle of the mandible and masseter muscle, some posterior fibers pass superficial and afterwards turn medially in order to insert within the skin of angle of the mouth through risorius. The cervical branch of the facial nerve supplies the platysma. Acting superiorly: The platysma gives off vertical rims within the skin of the neck releases the pressure of skin above the underlying veins, therefore helps in the venous return. Acting from below: Moves the angle of the mouth down and sideways when expressing terror or horror and it depresses the mandible. The anterior edges turn out to be cordlike and loosely hanging away from the front of the neck, as a person ages even if the platysma is relaxed. That gives the skin and face an aged look and texture. While closing an incision in the neck the surgeons, suture platysma meticulously as a separate layer in order to avoid adhesion of skin and subcutaneous tissue towards the deeper neck muscles, for the reason that such as the deeper muscles tightens or relax, these adhesions make the skin which is spread over the surface to move and the wound heals with an unsightly scar, which is undesirable cosmetically. Since the superficial veins of the neck are located under the cover of platysma, the retraction of divided platysma keeps the cut veins open. Due to their attachment to the deep cervical fascia these veins cannot retract. But, if deep fascia is cut, most of the bleeding stops and the veins retract.